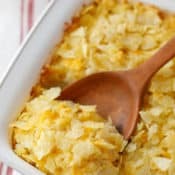 Y’all, there are a lot of hashbrown casseroles on the web, but I’m about to tell you why my cheesy hashbrown casserole recipe beats every single one of them. Well, at least in my opinion it’s the best, and my kids will back me up. 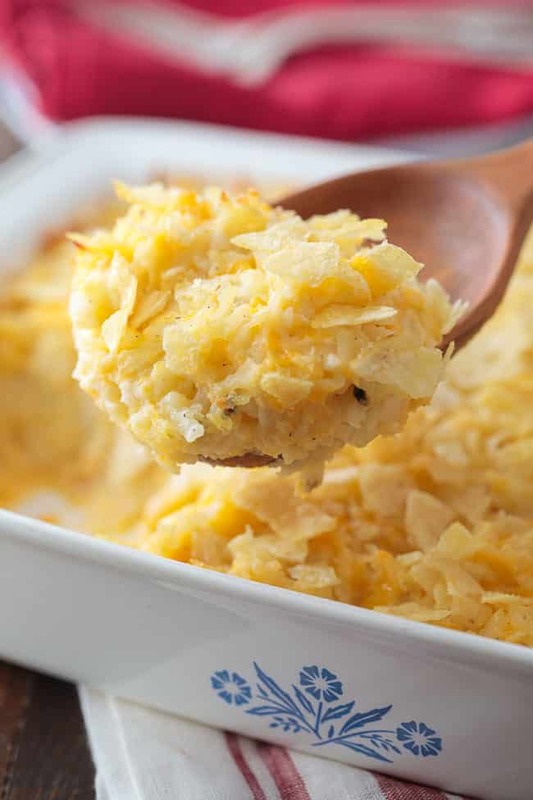 What makes my hashbrown casserole the best is the salty, crispy layer of potato chips on top! Just look all that cheesy casserole goodness. The first time I had a cheese and frozen hashbrown casserole, I was a kid. My grandma’s best friend made it once, but she used a cornflake topping. Honestly, you can’t go wrong with a cornflakes topping either, but I strongly prefer using crushed potato chips on top. Hello, my name is Crissy and I’m addicted to potato chips. 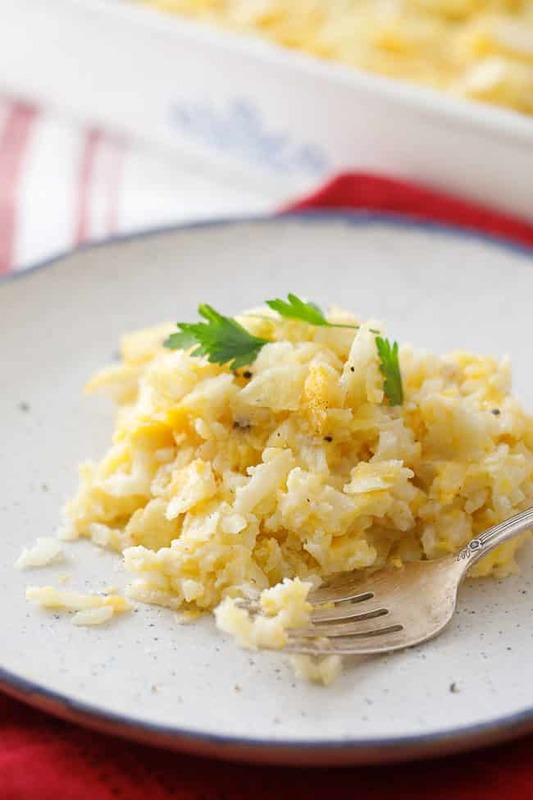 This is such a simple recipe and one that my family loves for breakfast or dinner. It’s also quite versatile. You could easily add sausage, crumbled bacon or maybe some chopped bell peppers to spice this recipe up a bit. 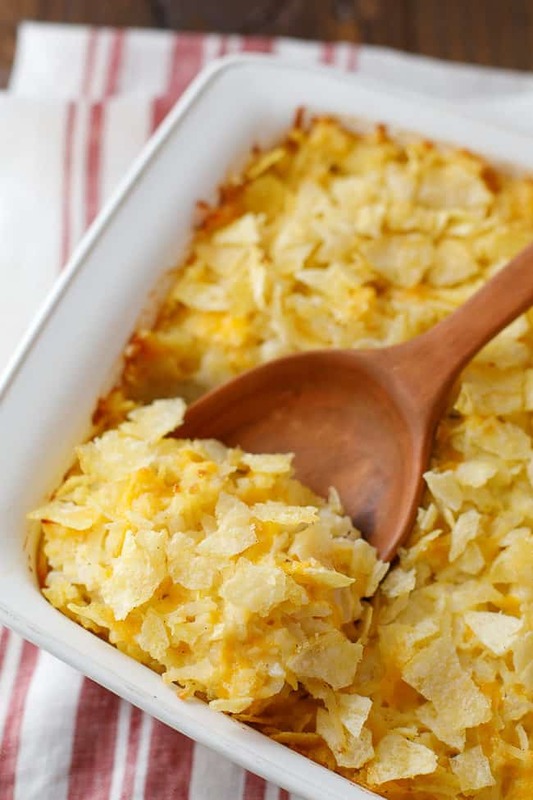 I just happen to love this cheesy hashbrown casserole exactly the way it is. It’s so creamy, comforting and delicious. 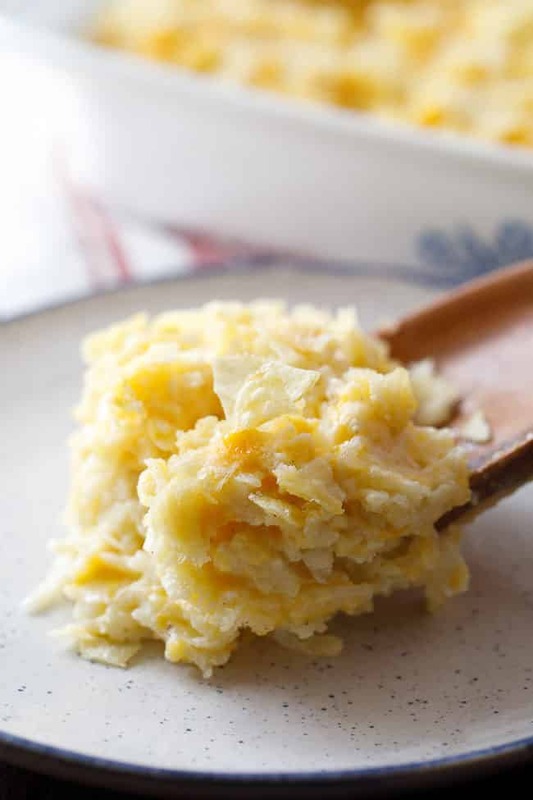 I guess the burning question here is how to categorize this tasty hashbrown casserole recipe. Is it a main dish, a side dish, a breakfast casserole? Let’s not get all hung up on labels. This dish is incredible no matter when or how you eat it. In a large bowl, combine the thawed hash brows with the butter, cream of chicken soup, sour cream, onion, cheddar cheese, salt, garlic and pepper. Place mixture in a 2 quart casserole dish. Sprinkle crushed potato chips over the top of the casserole.